• Field programmable features for on-site convenience. • Engineer test button - for easy on-site testing. • Multiple lock-on protection features. • Internal pull-up resistors for negative trip eliminates the need for external resistors. • All inputs may be programmed individually for positive or negative trip making the transmitter compatible with any control panel. • A power-up signal is sent which can indicate that the transmitter has been tampered with by an insider. • Intelligent mains fail/restore signalling varies signal delays reducing unnecessary network congestion during power failures. The installer, however, is able to test mains fail/restore signals without delay for five minutes after applying power to the unit. The mains fail delay can now be set for between 15 - 250 minutes. • Signal buffering is used when inputs are triggered simultaneously. Signals are stored in the transmitter and sent in event order. • Manufactured using the latest surface mounting techniques which minimises the chances of human error. • The transmitter draws less current placing less strain on the system battery. • LED indicates seven different transmitter conditions for fast and simple diagnostics. above alarm panel output voltage ranges. will require a level converter interface. • Low battery and restore reporting. • Self test programmable between 1-250 hours. • A programmable mains fail/restore delay can be set from 15 - 250 minutes plus a random delay to prevent signal clashing. The factory default is 15 minutes plus the random delay. The installer, however, is able to test mains fail/restore signals without delay for thirty minutes after the installation. • Signal buffering - when inputs are triggered simultaneously they are stored in the transmitter and sent in priority order. 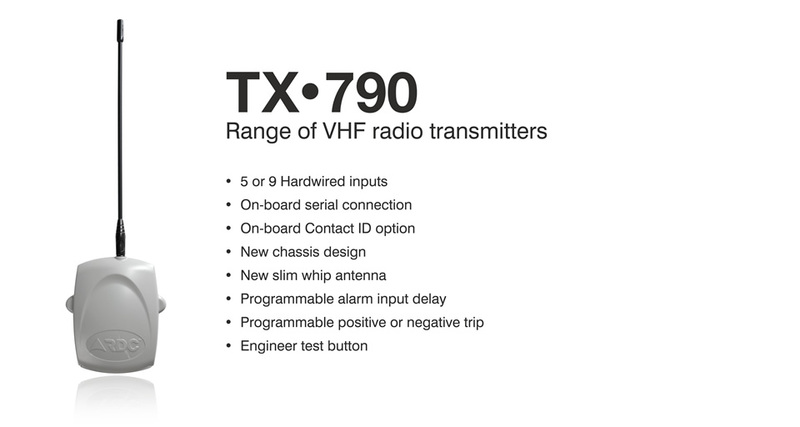 • LED indicates 7 different transmitter conditions. A simple two wire installation allows extra data to be sent in the Contact ID format. Open/lock-up by user number or alarm by partition and zone can be sent in a single signal. A serial link between the transmitter and the panel provides extended radio telemetry data reporting. It provides a neater solution with fewer unsightly wires and quicker, easier installation.